In current events concerning Russia’s involvement with Ukraine, there is a lot to be said about the culture, specifically language(s), and their significance in influencing opinions and outcomes. 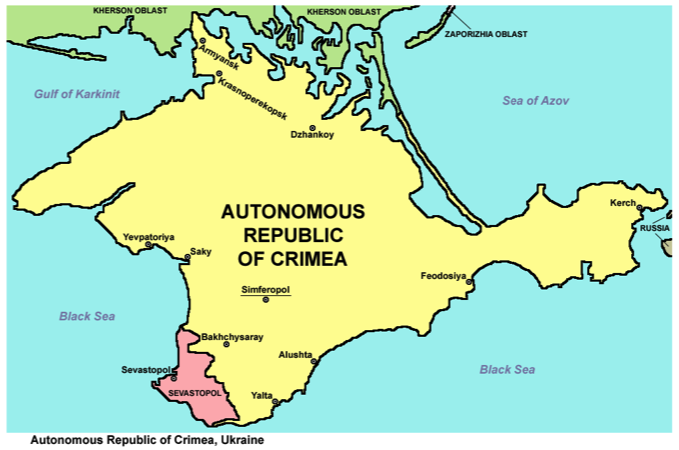 Crimea is today’s topic at hand, and in this blog I aim to address the elements making Crimea seem like a discrepancy in the first place. The way I view what I am labeling as “The Crimean Discrepancy” is a matter of perspective and opinions. Perspective as a concept claims authenticity in terms of the “eye of the beholder.” I would consider Crimea as a battle of who is beholding the perspective. Lets look at some facts first. With the argument of authenticity in mind, I consult the ever-present oracle that is Wikipedia. Here is what it says in a nutshell. As of February 2014, Ukrainian authorities lost control over Crimea to Russia. However, as seen and heard from Kiev, Crimea continues to be recognized as an autonomous territory of Ukraine. The recognized languages within the region are Ukrainian as an official language and Russian along with Crimean Tatar. MOST IMPORTANTLY, as of 2001, ethnic groups in Crimea yield the most influential information. 58.32% of the ethnic groups in Crimea are Russian. Following at 24.32% are Ukrainians and at 12.1% are the Crimean Tatars. With this in mind, let’s return to perspective. I propose that the discrepancy is a matter of the anthropological identification of space and place. My rudimentary rationale for this term is that space and place can be compared to “house and home,” where a house is a building you can live in, and home is the significance tied to the location by living in it. From the eyes of Ukraine, Crimea is their territory; it is specifically a location in their country’s boundaries. With reference to the almighty Google Maps, it can be seen that Crimea does indeed have a physical connection to Ukraine, while only coming close to the southwestern boundaries of Russia. In an article from MyMedia, progress is listed in reference to schools within Crimea. “Among 58 children of the 11th grade, 27 want to continue their education in Ukraine, while the rest will stay in Crimea, where authorities are planning to change schools' criteria to match that of the Russian education system within the next three years.” These facts provide evidence to Russian influence in the education system, showing Russia’s claim over Crimea as further spreading. Politically, dominance over Crimea will remain an argument. Language and culture have always generated arguments of authenticity, as well. How “cultured” you are, or so to speak, can be swayed whether or not you speak a language with fluency. Crimea, based on the facts, is Russian when it comes to fluency in language, but it is officially Ukrainian… correction, it was Ukrainian. Thus, I would be comfortable with calling Crimea a gray area. The region is stuck in a situation where its location is outweighed by the internal dominance of a Russian past, a past marked by Russian language use. I would not go as far as saying that either party should have the region to themselves, but it remains labeled on the map as an autonomous region of Ukraine with a majority of its population being ethnically Russian. Let us remember the Chechen War: is Crimea headed in the same trajectory? What do you think? The author of this blog entry is Andrey Starostin, senior at the University of Illinois. He is majoring in English Literature. Andrey is planning on pursuing professional photography while working on his book. He is a native speaker of Russian. He wrote this text in the seminar LING 418, Language and Minorities in Europe.